2016 was momentous for all things email. We saw the iOS 10 update that brought big changes to the Apple Mail app – namely support for HTML 5 which allows for video in email (yay!). Gmail finally started rolling out changes to support responsive design, and email designers everywhere rejoiced. Cyber Week 2016 was huge for mobile, smashing all kinds of records. In general, we saw more brands embracing contextual email technology, like advanced personalization, video in email and more. It became clear that a solid strategy coupled with the right technology was no longer just an ideal – it’s absolutely necessary for any successful brand. Let’s take a look at a few examples of that technology in action over the past year. We’ll also show you how you can apply these strategies to any of your campaigns in 2017. What we loved: You’ve probably head about this campaign, or maybe you even received one yourself. In case you missed it: Spotify used customer data to created highly-personalized campaigns for their listeners and their artists. 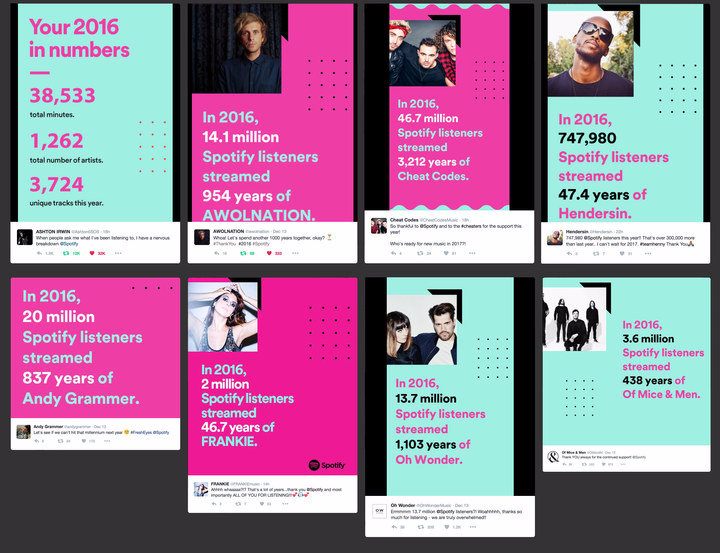 Listeners loved the snapshot of their favorite artists, and artists loved seeing how many years worth of music their fans streamed. Steal this idea for 2017: Use any data you have on your subscribers to tell their unique story with your brand. This can be their transaction history with you (like items they purchased), articles they read or points and badges they earned. You do a year-in-review like Spotify did, or use it as a reactivation campaign to re-engage customers who haven’t made a purchase in a while. What we loved: Headspace is a meditation app that wanted to promote a New Year’s deal to their subscribers. The GIF they used was eye-catching and unusual, yet simple and to the point. They could have listed a myriad of benefits of mediation in this email, but the focus on just one thing makes it stand out. Steal this idea for 2017: Use animated GIFs in your emails to illustrate a big idea: new products in action, app launches and updates are perfect use cases for GIFs. Keep your GIF simple and focused on one thing to avoid confusing your customers and making more work for yourself. Here’s a guide to using GIFs in your emails. 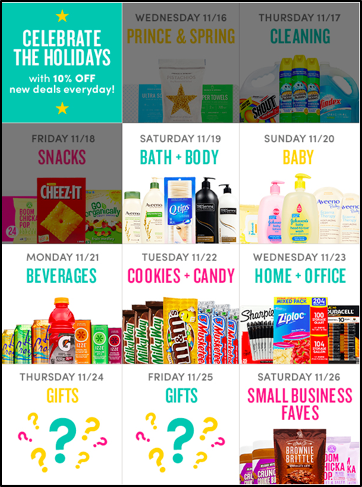 What we loved: Boxed needed to promote 12 days of holiday deals, with a new deal featured every day. Instead of creating 12 different emails, they created just one time-targeted email that updated automatically in real-time with the status of expired and upcoming deals. Steal this idea for 2017: If you have a small team, limited resources, zero time to spare or all of the above, you need email content automation in 2017. How does it work? Using live content that updates at the moment of open, your emails automatically showcase the right content at the right time. It allows you to spend less time coding and designing emails, and more time creating awesome email content. Learn more about live content and email content automation. What we loved: For their holiday campaign, Hotel Tonight wanted to drive engagement from their subscribers. But their poll did more than delight people with funny, irreverent content: Hotel Tonight collected valuable subscriber data that would help them shape future campaigns. Steal this idea for 2017: It’s time to take a good look at the data you’re already collecting from your subscribers and identify how you can use it in your email campaigns. If you’re not collecting the data you need to move forward or you’re simply not collecting enough, add a live poll to your next campaign. What we loved: Once you place an order online, you began to anxiously await its arrival. What if tracking your package was as easy as re-opening the confirmation email from the company you ordered from? Philosophy provides live tracking info in their transactional emails so their customers don’t have to go searching for it. Steal this idea for 2017: If you want to provide a seamless online ordering experience and make life a lot easier for your customers, add live order tracking to your transactional emails. Let your customers know that they can simply re-open the email to see the latest order status. What we loved: Video in email is unexpected as it is. Add a video personalized with your customer’s name, and you’re sure to surprise and delight. 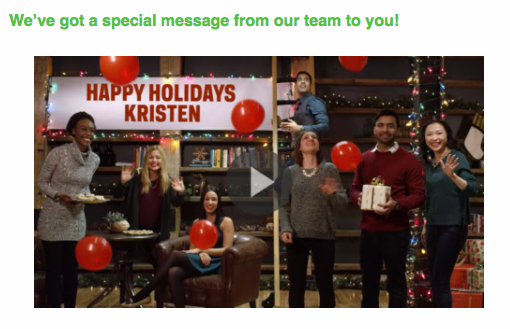 Vidyard used their holiday campaign to send a video personalized with their subscriber’s first name. The campaign not only grabbed attention, it showed off the company’s capabilities in a clever way. Steal this idea for 2017: If you haven’t already, this is the year to add video to your emails. Try sending a still of your video with a play button that, when clicked, brings your reader to the full version of your video. This will ensure your video doesn’t break across email service providers. What we loved: To drive traffic to their trending products page, eBay sends a fully-automated email that pulls content from their website that updates in real-time at the moment of open, ensuring all product details and prices are updated. The email is also personalized based on the user’s name and location at the time of open. Steal this idea for 2017: Want to promote multiple deals, daily or weekly sales and ensure your email content is always fresh and consistent with your website content? Intelligent content automation lets you pull content directly from your website and updates automatically. So if you have a lot going on, intelligent content automation can help you completely automate your email production process. Ready to level up your emails in 2017? Use the ideas listed here to help guide your email marketing campaigns into 2017. Want to learn more about what contextual marketing can do for your brand? Check out our eBook, Everything You Need to Know About Contextual Marketing. This entry was posted in Automation, Contextual Marketing and tagged 2017 ideas, contextual email on January 11, 2017 by Kristen Dunleavy.